Within these four tests, the Word Knowledge and Paragraph Comprehension tests are combined into an overall Verbal Ability score and all of them are combined into your ultimate AFQT score, sometimes referred to as the Military Entrance Score. This site provides free AFQT practice test subtests for each section. Click on the “START TEST” button within each section to begin that AFQT test practice section. The Math Knowledge section of the AFQT test includes 16 questions to be completed in 20 minutes. To succeed in this section of the test the applicant must have a working knowledge of basic concepts of math. Click the “START TEST” button below to begin. This is Part 5 of the ASVAB test. Part 5 covers Mathematics Knowledge. 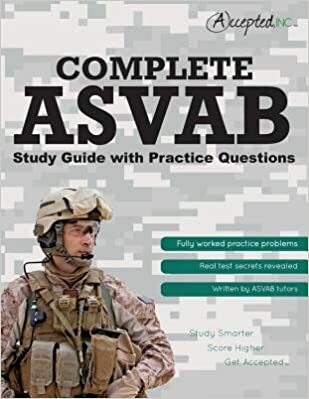 Your test score from the Mathematics Knowledge goes into your final Armed Forces Qualification Test score (AFQT score), so it is important to prepare for this subtest of the ASVAB. You will have 20 minutes to answer 16 questions. When you are ready, click the “Start Test” button below. You have already completed this test before. Our site only allows each person to take each test only one time. which contains practice test questions! asvabpracticetestonline.com may get a commission. In this section of the AFQT test, there are 16 questions to be answered within a 39 minute time limit. These questions focus on high school level arithmetic reasoning skills, so a working knowledge of things like ratios, calculating interest, and fractions can be very helpful. Click the “START TEST” button below to begin. This is Part 2 of the ASVAB test. Part 2 covers Arithmetic Reasoning. You will have 39 minutes to answer 16 questions. When you are ready, click the “Start Test” button below. The Word Knowledge portion of the AFQT test includes 16 questions and has an 8 minute time limit. This portion of the test is designed to assess how well the applicant understands the meanings of words, as well as their synonyms and antonyms. Click the “START TEST” button below to begin. This is Part 3 of the ASVAB test. Part 3 covers Word Knowledge. It is important to prepare for the Word Knowledge subtest as the score from this test makes up a part of your Armed Forces Qualification Test (AFQT) score. You will have 8 minutes to answer 16 questions. Click on the “Start Test” button below to begin the test. You will not be able to pause the test once started. The test taker’s ability to critically interpret written information is tested in the paragraph comprehension section of the AFQT test. This section includes 11 questions to be answered in 22 minutes. Click the “START TEST” button below to begin. This is Part 4 of the ASVAB test. Part 4 covers Paragraph Comprehension. You will have 22 minutes to answer 11 questions. When you are ready, click the “Start Quiz” button below.